It is vital that you choose the correct Dog food for you Springer Spaniel. After all, just like Humans, Dogs require food to keep them fit, healthy and full of energy. With so many different products available on the market, it can sometimes seem overwhelming and confusing as to which one to buy. We’ve done some research into the Best Dog Food for Springer Spaniels and have put together this summary highlighting some of our favorites. Remember: Even if we wanted to, there are simply too many choices of Dog Food available. It would be impossible to review them all. The above suggestions are recommendations are based on our research. We would always advise you check with your veterinarian if you have any specific questions about your Dogs diet, especially before making any changes. The English Springer Spaniel does best with a diet that will help provide the nutrition they need to give them enough energy for the day. Of the above Dog Food Brands, we personally recommend Tate of the Wild, Canine Formula. It is best to feed a Springer a diet that will maintain their playful and working energy. The food you choose should therefore be specifically formulated to look after the heart, kidneys, liver, and blood circulatory system. So whats so good about taste of The Wild? Unlike other Dog Food Brands, Taste of the Wile doesn’t contain any Grains, it is Grain free. Feeding your Springer Spaniel a Cheap Dog food full of grains can contribute to obesity due to the high concentration of grains. Since these dogs are pre-disposed to obesity already, feeding dry dog food will only heighten the chances of obesity and related medical conditions. It’s also free from Toxins, an unnatural ingredient, often found in cheap low quality Dog Foods. All the products that we’ve recommended are extremely high quality. But that’s not necessarily the same for every brand available. Kibble, more often referred to as Dry dog food has historically had a bad reputation. As with any overproduced mass market product, they are often produced to be sold as cheaply as possible. This can often sacrifice quality by using low quality ingredients. A poor quality Dog Food will have a lot of carbohydrates in it which helps bind the other ingredients together but if dogs are fed the proper amounts of protein they do not need carbohydrates in their diet. Store bought Dog Food isn’t the only option for your Springer Spaniel. A home prepared diet is becoming increasingly popular. In fact a Dry Dog Food can be an excellent complement to home prepared dog Food, or also used as part of a mixed Diet. A home prepared diet means that you can feed your Springer the best foods for their particular health needs. This can be particularly advantageous if they are suffering from a specific health condition. If you are comfortable in feeding a diet of raw meat and vegetables then you can get really adventurous with what you feed your Dog. If you are new to feeding your dog a raw diet it is best to check with your veterinarian first and do some research about home prepared meals for dogs. You do have to do your research which can be a disadvantage if you do not have a lot of time. If considering a raw Food Diet the preparation time and handling of such large quantities of Raw Meat can put many people off this somewhat difficult process. Also, preparing food at home can be costly and time consuming making commercially prepared foods a much more attractive option for time conscious pet owners. When researching the Best Dog food for your Springer, make sure they don’t contain anything that your Springer Spaniel should not be eating. 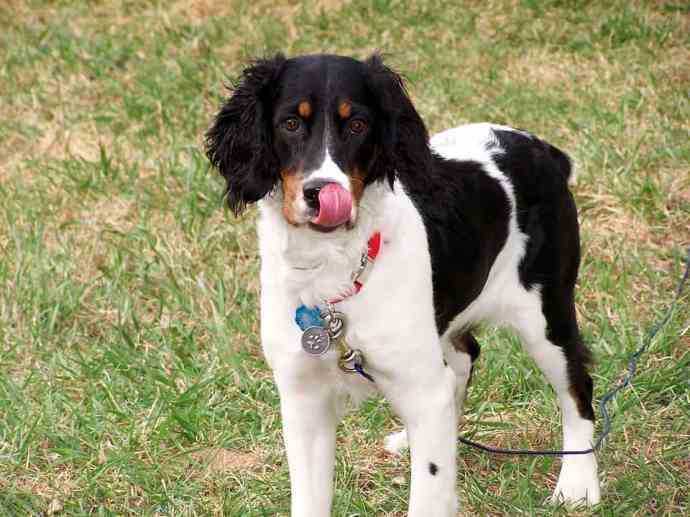 Your Springer Spaniel should not have raisins, grapes, onions, or large amounts of garlic. They should also not be given chocolate or alcohol. Your Springer should also not be given bones from poultry or fish as they can easily splinter causing your Dog to choke. Dairy products are also not recommended. By-products which are a filler and not fit for consumption should also be avoided. As you can see, there are a wide range of exceptional Dog Foods available, but equally there are some very cheap non-nutritious examples too. Choosing a high quality Dog Food while a little more expensive, will be much better for your Dog. 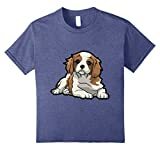 A highly energetic Dog, the Springer Spaniel needs a high quality Dog food. Taste of the Wild, Canine Formula is an excellent choice for this Breed. Available in a range of delicious options that your Dog simply won’t be able to resist. You can rest assured that taste Of the Wild has been forumalted with your Dogs health and Nutrition first and foremost. While it may be a little pricier than some store bought alternatives, you are paying for quality. 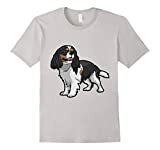 Ultimately it is your choice as to what kind of food to feed your Springer Spaniel, so educate yourself and decide what will be best for your household. If opting for a high quality, Dry Dog Food, packed full of Natural ingredients, you really can’t go wrong with Taste of The Wild, Canine Formula. Keeping your dog healthy right from the start will mean fewer trips to the vet and less expensive bills. Feeding a dog properly may seem expensive but dealing with health issues caused by a poor diet will prove to be much more costly in the long run.